Apply the indicated color all over your eyelid, bringing it slightly into the crease. 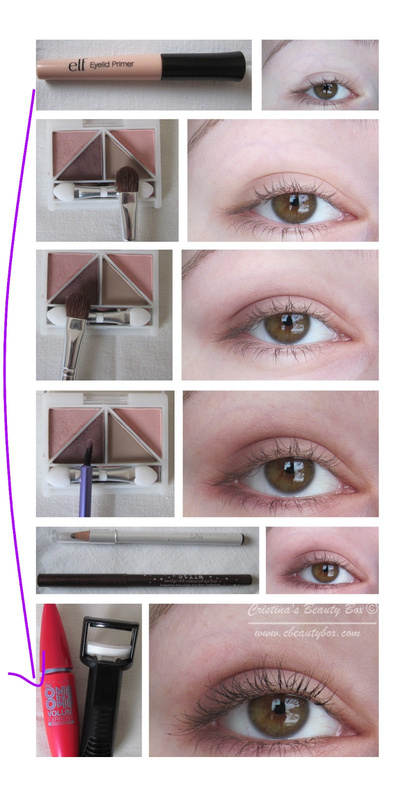 Apply the indicated color into the outer V and into the crease and blend blend blend. With an eyeliner brush, smudge the indicated color into your lower lash line. With a brown eyeliner, line your waterline and upper lash line. (I used Stila Smudge Stick on my upper lash line and e.l.f. eyeliner on my waterline, but you can use only one eyeliner - no need for both). Curl your eyelashes, apply mascara and you are done! OPTIONAL: you can use a highlighting color on your inner corner and brow bone. I added that later, when I was doing my face make up. To be honest, this e.l.f. quad was just sitting around unused, but I think I will use it more from now on, because the eyeshadow lasted 10+ hours with a primer and it didn't crease at all! Anyways, what is your everyday eye? What shades do you prefer for everyday ? ohh very flattering. I love how you used mostly drugstore!